Organised by Assistant professor Signe Krag (Aarhus University) and PhD student Sara Ringsborg (Aarhus University). Within the framework of the Palmyra Portrait Project two one-day conferences are organised, one in October 2016 and one in February 2017. These will address aspects of representations of women and children in Roman Palmyra. Although research on Palmyra has been undertaken for a century and has covered aspects such as the religious life, urban and funerary architecture, portraits, textiles and epigraphy, representations of women and children in Palmyra have received little attention. Therefore, much remains to be investigated in order to reach a deeper understanding of the social structure of Palmyrene society. In Palmyra sculptures as well as epigraphy indicate that the family held a pivotal role, which did not seem to become less central over the centuries. Displays of family affiliations were used in different spheres in the city to claim group membership and status and it is especially in this aspect that women and children held a prominent role. Therefore, we set out to explore different aspects of representations of women and children and what meaning this might have carried in relation to the Palmyrene family structure and wider Palmyrene society. Women and children are often represented in the archaeological material stemming from the Palmyrene funerary buildings in which various family constellations were displayed. In the funerary sphere men, women and children often occur in family constellations. Group portraits compose around 40 percent of the funerary sculpture from the 1st to the 3rd century AD. Moreover, representations of women compose around 40 percent of the sculpture and children 8 percent. However, frequently adult children were portrayed together with their parents in the banquet reliefs and sarcophagi as well. Therefore, representations of women and children played a significant role in the funerary sphere. In the archaeological and epigraphic material from the Palmyrene public and religious spheres women and children also occur. However, the picture is more complicated since the evidence from the public and religious spheres is much more fragmented than in the funerary sphere. Based on the evidence from the public and religious spheres women are often treated as having played lesser roles than men. Certainly there was a focus on the role of the man, both in the public and private spheres, however, until now, apart from exceptions such as Queen Zenobia, the role of women and children in Palmyrene society has only rarely been discussed. In the first conference we ask contributors to shed light on the role the family held in the public, religious and funerary spheres. Papers should explore what the family meant in the Palmyrene society exemplified through ways in which family constellations were constructed in visual representations, epigraphy and written sources. For example, based on epigraphy from Palmyra researchers have reconstructed genealogies for various families, but which insights do the genealogies offer on relationships in Palmyra? In the first conferences the central aspects addressed are: how Palmyrene families were organised, the relationship between women and their husbands and male relatives, and the role children played in family constellations, including attitudes towards children. In the second conference we ask contributors to explore the religious positions of women and children in the public, religious and funerary spheres. For example large frequencies of public religious dedications are found on altars and these often address the family unit, but what can these reveal about the role of the family and about the roles held by women and children in religious dedications? The aspects addressed in the second conference are: the use and constructions of family connections in religion, the religious and ritualistic role(s) held by women, and in which ways children occur in religious aspects, especially addressing the inclusion of children in religious dedications. Seats will be filled based on a first-come, first-served basis. Aarhus Airport is located 40 km north of Aarhus. An airport bus service operates between the airport and Aarhus Central Station ("Banegårdspladsen", see map). A single fare is 115 DKK, and the bus accepts Dankort, Visa, Mastercard and JCB. The bus ride takes approximately 55 min (see timetable). 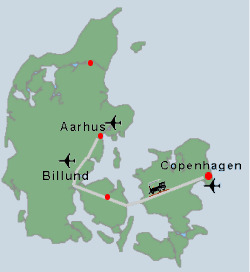 Billund Airport is located 100 km south of Aarhus. An airport bus service (Bus 912X) operates between the airport and Aarhus Central Station ("Banegårdspladsen", see map). A single fare is 140 DKK, and the bus accepts major credit cards. The bus ride takes approximately 1 h 45 min (see timetable). Copenhagen Airport is the main international airport in Denmark, located approximately 10 km from Copenhagen city centre. Copenhagen Airport is a 3 h 30 min train ride from Aarhus. A single fare (economy) is 418 DKK, incl. a seat reservation (for the sake of convenience, we recommend that you reserve a seat along with your ticket). You can purchase a ticket using Rejseplanen. In the FROM field, "Kastrup Lufthavn, Udenrigs"
In the TO field, write "Aarhus H"
Rejseplanen is also available as an app for smartphones and tablets.